“Assets” here refers to the “Net Assets” in financial statements. Assets of public interest incorporated foundations under the old Civil Code Article 34 are maintained through the investment management of marketable securities, stock and bonds, etc. Their book value was recorded in their accounting reports until FY 2005, but in 2006 the accounting rule for PICs was revised to use market value or fair value in accounting records. Since this change was still in progress during FY2011, some foundations announced results based on the use of new accounting rule, while others used the old rule in their accounting. In Group B, 703 of 771 foundations, or about 91%, have shifted to the new standards, while others followed the old standards. Therefore, calculation or comparison cannot be made on the same basis for such data as total assets and/or ranking of assets. The following analysis is based on the two different standards. 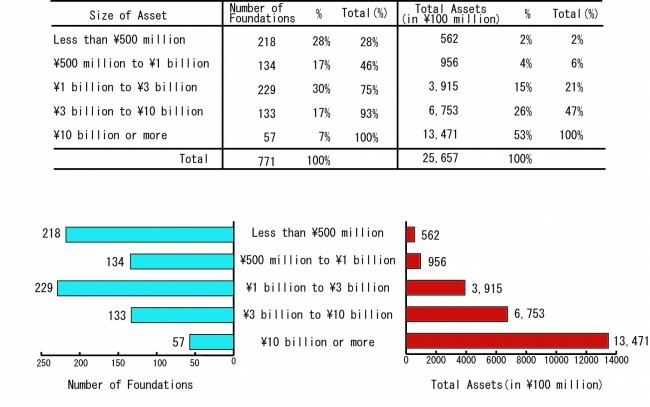 At the end of FY2011 (March 31, 2012, with a few exceptions) the total assets of 771 foundations in Group B is approx. \2.5657 trillion. Table 1 and Figure 3 show the distribution by the size of assets, with these 771 sorted into five ranks. 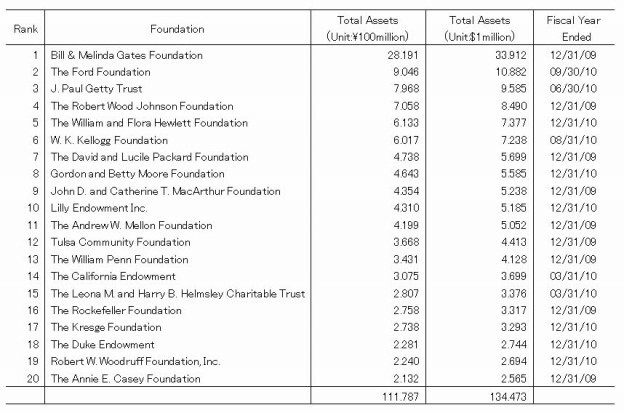 Foundations with assets worth less than \1 billion were 352 of 771, or 46%. Only 57 foundations, or 7%, had assets worth \10 billion or more, and the combined value of their assets accounted for 53% of the total. In FY 2005, when the old accounting standards were applied 100%, foundations whose assets were worth less than \1 billion constituted 49%, almost equivalent to the rate in FY2011. On the other hand, those with assets worth \10 billion or more were 3%, or 21 foundations that was less than half the percentage of FY2011; and their combined value stood 33%, which means a little more than half the percentage of FY2011. The new accounting standards can clearly demonstrate the division of two extremes between the majority of small- and medium-scale foundations and the limited number of large-scale foundations. 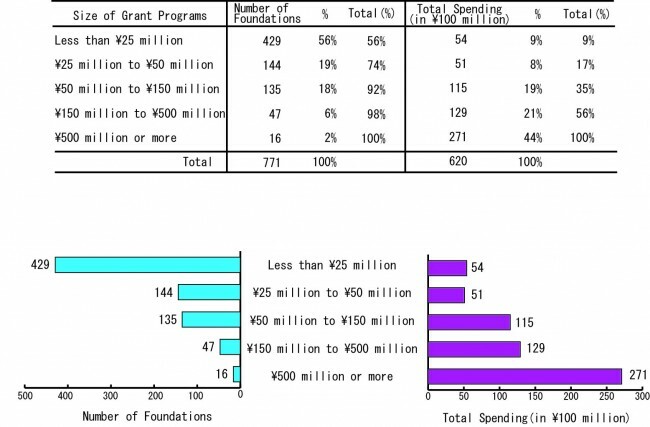 Table 2&3 show the comparison of top 20 foundations in the U.S. and Japan, where the differences in the total are as large as 14 times. For reference, their ranking in FY2010 is shown in the table. 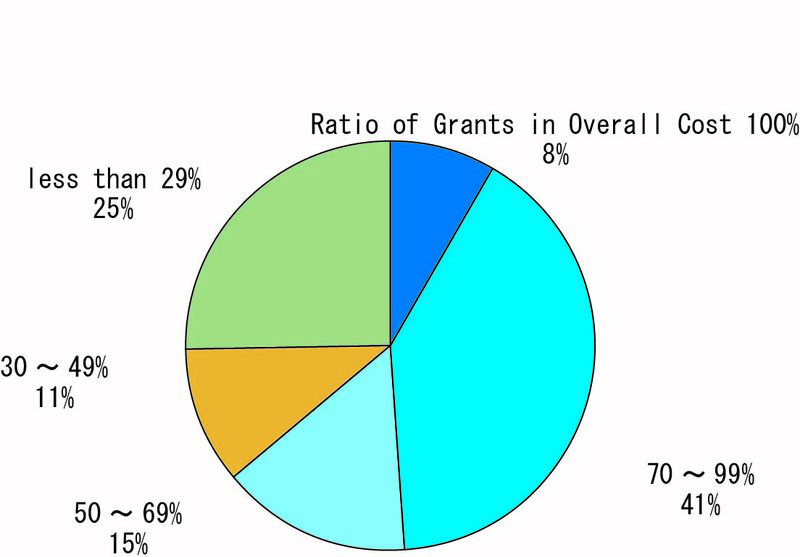 Distribution of fund is the amount of money endowed by grant-making programs in the form of grants, scholarships, and awards, etc. 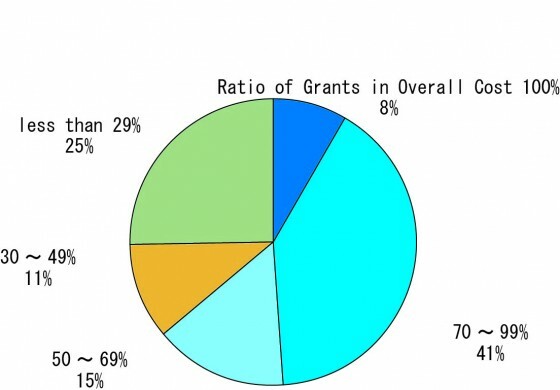 Annual distribution funds in FY2011 by Group B foundations were \62.0 billion in total. 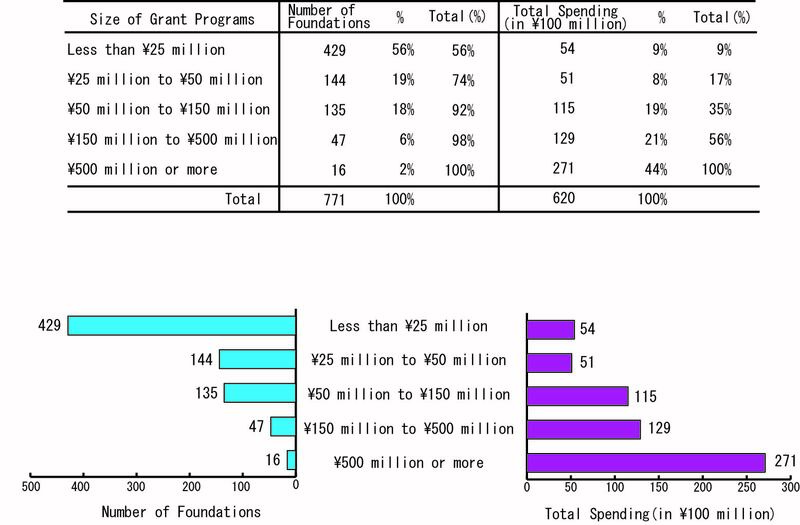 Table 4 and figure 4 show the amount of funds distributed by the number of foundations by size of annual grant spending. Those 771 foundations were sorted into 5 ranks, where 573 foundations, 74% or nearly three fourths, spent less than \50 million in grants. 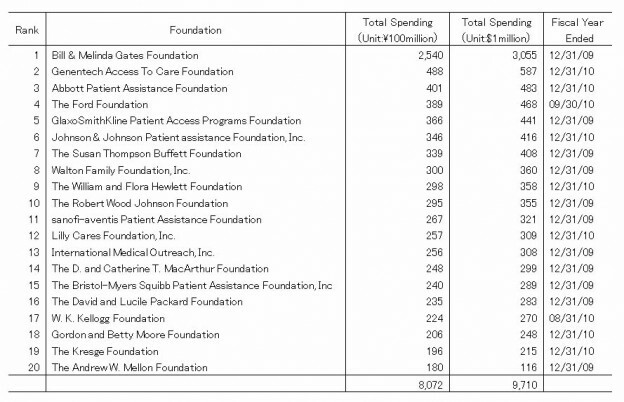 Only 16 foundations, or 2%, spent \500 million or more. 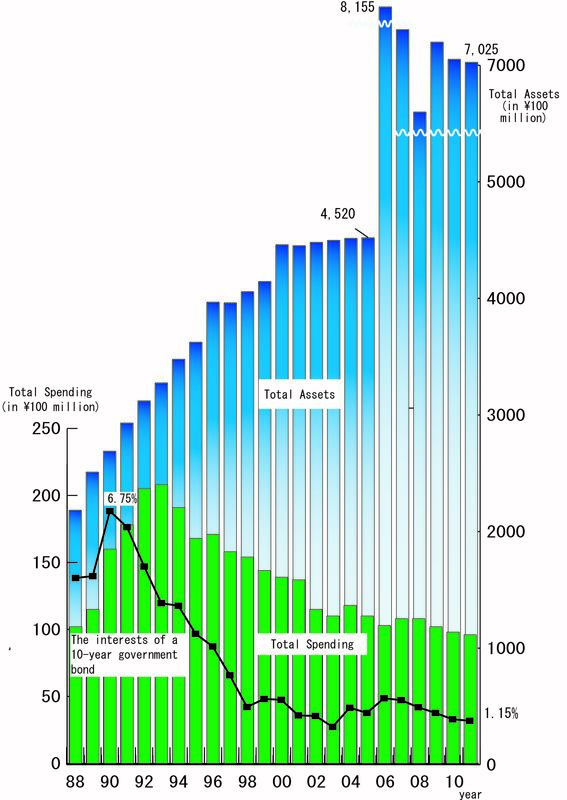 The amount of their spending was \27.1 billion, which made up 44% of the total. 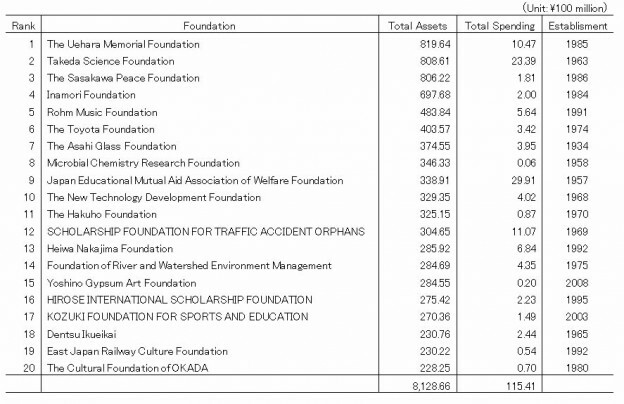 In about half of the foundations’ yearly grant expenditure was less than \25 million. 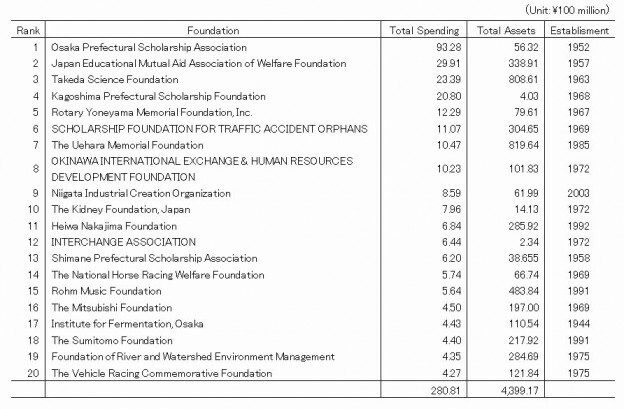 Table 5 shows Japan’s top 20 foundations by annual grant distribution, and Table 6 shows the U.S. top 20 list. 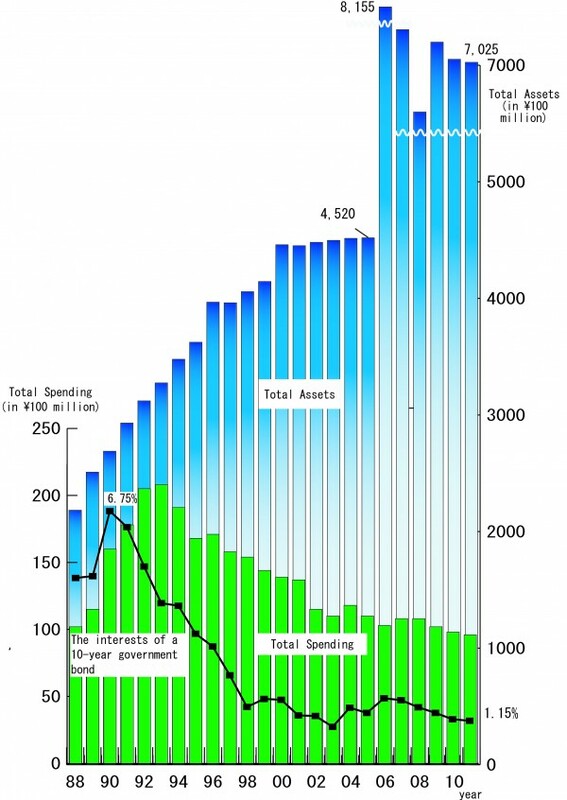 Compared their total amount of spending, the U.S.-Japan difference is as large as 29 times. It can be seen that combined assets of 105 foundations have generally continued to increase since 1988, but after 2000 they have been leveling off. Combined grant spending began to fall in 1994, but the inclination of the phenomenon has been gradual after 1998. It is obvious that the extraordinarily low interest rate on savings accounts that has been long prevailed in Japan seriously hampers many grant-making foundations that have been obtaining their main fund resources from interest on bank deposits. Some foundations report that they have had to suspend grant programs for a few years due to financial constraints.